I received this book for free from Author, Blog Tour in exchange for an honest review. This does not affect my opinion of the book or the content of my review. Happy Saturday, Lovelies!! I’ve got another quick review for you! My third review for Faith Blum’s Hymns of the West novella blog tour is today! 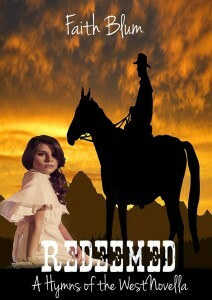 REDEEMED was another great quick read, but slightly different than I LOVE THEE and PASS ME NOT. There was a bit of “son is mad at dad and wants to get back at him” plotting. The outcome was unexpected and perfect! Go pick up your copies of all three novellas right after you enter the giveaway below!! Faith, thank you for letting me take part in your tour!! Faith has TWO awesome giveaways below! Be sure to enter!! Thank you for reviewing “Redeemed” for me!